children | This Thing Called Life . . .
One of my favorite sites is Greg Laurie’s Harvest.org. I receive his daily devotional emails, and although I’m a little late in sharing this because it was for Father’s Day, it is always appropriate for parents to pray for their children. Happy Father’s Day! For Dad (or Mom), here is a prayer list you can use to pray for your kids! Pray that your child will come to the saving knowledge of Jesus Christ. Pray that your child will have a healthy fear of the Lord. Pray that your child will have a heart for the lost. Pray that your child will love obedience. Pray that your child will develop godly character. Pray that your child will love and want to live God’s Word. Pray that your child will recognize God’s voice. Pray that your child will love learning. Pray that your child has an appetite for truth. Pray that your child will love the things God loves. 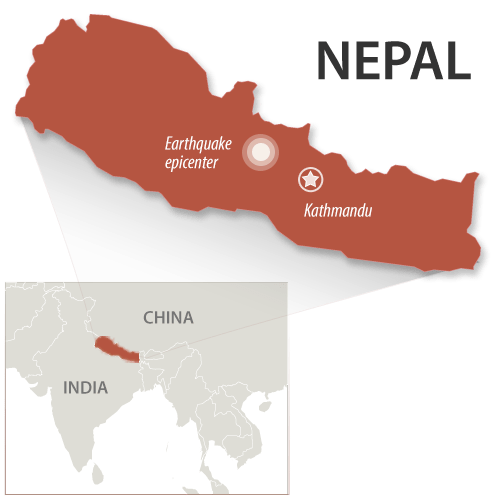 A 7.8 magnitude earthquake struck central Nepal, less than 50 miles outside the capital city of Kathmandu, just b efore noon Saturday, killing more than 1,000 people in Nepal, India, Tibet and Bangladesh. The death toll is expected to rise. Rescuers in Nepal are searching through the rubble for survivors. More than 1,700 have been injured, and hospitals are overwhelmed. Gospel for Asia has 450 churches and 20 Bridge of Hope centers in the region. Some churches and some centers have been destroyed by the quake. Between 30 and 40 of Gospel for Asia’s missionaries serving in Uttar Pradesh, an Indian state bordering Nepal, are headed toward the destruction to help. This is estimated to be the worst earthquake to hit Nepal in 80 years. Read the rest here. Beloved, thank you for praying about this. I often post about prayer. There is nothing else like prayer. It blesses us and God to pray for others. Our hearts become one with those for whom we pray. And God uses our prayers for our good and for His glory. K. P. Kohannan is the founder and president of Gospel for Asia, and his wonderful book, No Longer a Slumdog, tells the story of how the children (the meek) of Asia have learned to pray. They daily use the power of prayer to affect their lives and those of their family and neighbors. When you teach a child that the God who loves them unconditionally answers prayer, miracles can happen. Sagan and his friends learned of the power of prayer from watching their Bridge of Hope teachers. Soon they were praying for those in need, while watching God answer. See what happens when they hear of a young boy with a terminal condition in a neighboring village. Beloved, please take the time to watch this 5-minute video. You will be touched by the faith of these little children that God is using to change lives in Asia. Click here to get a free copy of No Longer a Slumdog. Although today’s post is about something that I went through about 18 years ago, the message is still pertinent today. Have you ever needed to be in two places at the same time? The week before I was to serve as a counselor at a special camp for abused and abandoned children, I received a call from my father. My mother’s heart was acting up and she was back in the hospital. This time the doctors needed to perform surgery as soon as possible.There was no time for the camp staff to find a replacement for me, but I really felt the need to be with Mom right then. not to leave in haste or go in flight. I realized that even though those words were originally meant for the Israelites, God was using the same verse that day to tell me to calm down and go to camp as scheduled. He would work out the details and take care of Mom and her surgery. And as usual, He did exactly that . . . and so much more. As tears filled my eyes, I hugged both girls and quietly thanked God for allowing them to experience a close family moment with me. These girls—and many others like them—had been bounced from one foster home to another. They had no first-hand knowledge of what it means to be part of a family. As I made the two-hour drive home at the end of the week, I was struck anew at how well God leads us in our decision-making processes, if only we’ll completely trust in Him and His plans for us. He will always show us the right direction to take! The entire camp staff had assembled to greet our campers. We gathered in a circle, each in turn offering prayers for these precious children who had been placed in our charge for the week. Years ago, I was one of the counselors at this camp for abused and abandoned children. Because of all the hurt, pain and anger they experienced every day, we were determined to show them the joy, love and grace of their Heavenly Father. We heard the rumble of the diesel engine before we saw the bus and smiled nervously before turning to greet the unknown faces in the windows. We waved, wondering if they were as nervous as us—probably more so. The bus stopped in front of us and the door opened. When Peter, our ‘fearless leader,’ appeared at the top of the steps, we began waving again and welcomed our little visitors with shouts and whoops. Peter smiled his approval at our enthusiasm, then yelled, “Are you ready to meet your kids?” We clapped as hard as we could and were rewarded with smiles and waves from many of the children. Peter stepped out of the bus and consulted his clipboard. Every time he yelled a camper’s name, we jumped, clapped and shouted a spirited welcome. The children seemed to enjoy the noise and attention so we continued to act like crazy fools, hopping and jumping in accompaniment to our shouts of welcome. These children, who usually had no hope or joy in their lives, were like sponges in our care. They soaked in the wonderful news about a Father Who truly loves and cares for them and during that short week, learned how to turn to Him for comfort and peace. Unlike those little children, we’re old enough to understand that life isn’t always easy. Instead of lamenting what we can no longer do, let’s try shouting and singing joyfully for what we do have. No matter what is going on in our lives, God is always there with us and shouldn’t that make us want to shout for joy? Can I just say that I have the greatest children? Kathy and Alan—as well as my daughter-in-love, Denise—are such big blessings in my life and I truly do thank God for them every single day. Last year I shared a bit about each of my children and how special they are to me, which you can read here. I am thankful that they are all walking with the Lord and seeking to follow His will in their lives. Kathy, Alan and Denise, if you’re reading this, I love you all so much! For this reason I too, having heard of the faith in the Lord Jesus which exists among you and your love for all the saints, do not cease giving thanks for you, while making mention of you in my prayers; that the God of our Lord Jesus Christ, the Father of glory, may give to you a spirit of wisdom and of revelation in the knowledge of Him. I don’t normally write very much about my children so as to respect their privacy but I’m making an exception today because each of them is a true treasure to me. Kathy is my first-born and what a treasure she is in my life! I became aware of her existence while I was still engaged to be married to my first husband (Rick is my second husband). Like many women who find out they’re pregnant before marriage, my first thought was to have an abortion. Yes, as difficult as it is for me to share this with you, I gave very serious consideration to having an abortion. I even made the appointment but God had other ideas. After making the actual appointment, which was a couple of weeks away, I became so despondent that I slept almost every minute I was not working, and boy, did I have nightmares about babies dying! Since I’ve shared a tiny bit about Kathy here before, obviously I did not go through with the abortion. And the blessings I have received since deciding against the abortion have been HUGE! Kathy is precious to me in ways I can’t even express. I am so thankful and blessed that she is not “only” my daughter but one of my closest friends. In fact, she knows me better than anyone else, even my Rick. After all, she and I grew up together and we’re both pink girls! So, my Kathy, I know I’ve told you before how much you mean to me, and how thankful I am that you came into my life, but I don’t think I tell you often enough how precious our relationship is to me. Because, as you well know, my eyes would leak too much … as they are right now! Thank you for being such a wonderful and caring daughter to me. I am so proud of the woman you have grown to be, one who loves the Lord and seeks to always do His will. I ♥ you soooooooo much! Another treasure is Alan, my second-born. As I’ve shared before, I am one of 5 daughters (no sons), and Alan was the first boy born into our family in over 20 years. To say I was a bit unprepared to raise a boy is a huge understatement. Oh, in my babysitting years I had of course watched boys as well as girls. But raising up a boy of my own? As a child, Alan loved anything to do with trucks and construction equipment. He went through a phase when he was around 3 years old when he wanted to be a fireman. He had a child-size fire helmet (red) and a plastic riding fire truck and loved both of them. Fast forward to about 15 years ago [please forgive me, Alan, if my math is slightly off] when he became a true firefighter. And these days, as a captain, he’s wearing a red fire helmet again! Alan’s faith walk is a story that bears sharing because it shows how God honors the prayers of a faithful heart. Alan asked Jesus into his heart as a youngster, but as a teen and some years beyond, he became very disillusioned with organized religion and did not want to hear or talk about spiritual matters. That terribly hurt this mother’s heart but didn’t stop me from praying constantly for him to come back to the Lord. For many years I prayed for the Lord to bring a godly friend into his life, and not only that, but for a godly wife for him too. How was I to know that the Lord would honor each of my prayers by bringing Alan both things in one person? When Alan told me he was going to propose to Denise, he said, “She’s the one God used to bring me back to the light.” Oh, how happy and thankful I was to hear that! Alan thought he knew the Lord intimately then (that was about 3 years ago), but last year while he and his crew were helping to fight one of Arizona’s inevitable summer wild fires, God showed Himself to Alan in such an incredibly personal way that Alan was immeasurably changed. He not only became baptized—and I got to witness that special event!—but he is now involved with a mission team that serves in Albania to teach medical and life-saving procedures and protocol to medical personnel there. In fact, he has been on two missions so far and will be leaving on another one this September. Can you say gratified … joyful … thankful … and a bunch of other praise adjectives I can’t even think of right now? Alan, I always have and always will appreciate your love for me and how much you care for and want to protect me. I am so proud of the man you have grown into, and will never cease to thank God for you in my life. And I’m guessing He still has some mighty big plans for you, Son! I love you more than you can imagine! Denise is my next treasure. I know it’s a cliche, but I call Denise my daughter-in-love because she is! And besides, daughter-in-law sounds so technical… and legal [which it is, but that’s not the point here]. Denise was first Alan’s friend and that friendship blossomed into something more. I have often said that a solid marriage needs to have the base of friendship and Denise and Alan’s marriage has that. To say that Denise is a gift from God to Alan is to state the obvious. That she is a gift to our family is undeniable. She and Alan complement each other very well, and support each other spiritually and personally. When Rick and I were doing our premarital counseling, the example of an orange was used as a way to describe marriage. If you tear (not cut) an orange into two halves, each half has ragged edges and you can only fit the orange back together in one way. In the same manner, husbands and wives have strengths and weaknesses that complement one another so that they “fit well” together. Where one may be lacking something, the other can fill in. This is how I see Alan and Denise’s marriage. Denise just completes Alan and vice versa. I love Denise immensely because of who she is, because of her strong faith, because God chose her to bring Alan back to Him, because Alan loves her so. And last but not least: because she loves Alan—my son—so much. So it’s no wonder I consider Denise as one of my children even though I did not give birth to her. She is the daughter of my heart if not my body. Denise, I thank God for you every day and love you so much! So there you have it: the treasure of my children. They are truly astounding and precious gifts from God to me!